It's Z-Wave Thermostats and other Smart Thermostats we want to talk about today. We're going to compare them and break down the good, the bad, and the ugly with each one. If you're looking for any other devices, we have 39 more right here, but this article is all about the thermostats. Here is our comparison between the best sellers, for more details keep scrolling and we'll get into pros and cons of each model. The multiple sensors really won me over, it makes so much sense to have an average temp across different locations in your house, especially if you have an entire floor on one heating or cooling zone. In my house there are rooms that are much cooler or hotter than others , so having the average temp ensures the heat runs until the entire floor is comfortable, not just the room the thermostat is in. Many older thermostats provided a single dial or slider to adjust the temperature of your home. They used a mercury switch (a little glass tube filled with mercury) to turn your furnace or air conditioner on. Somewhat newer models replaced the mercury switch with a digital one, and may have included a timer of sorts to schedule when to turn the temperature down, like when you're away from home. Today's heating and cooling systems are much more complex. Depending on your system, you maybe able to monitor and manage a lot more than just air temperature. For example, you might also be able to manage humidity, air quality, and the overall comfort of your home. You may even have zone heating and cooling, which makes it easy to maintain different comfort levels throughout your home. Z-Wave offers a wide range of thermostats that will work on virtually any heating and air system. Each one allows you to program it to increase the comfort of your home while reducing energy costs. Z-Wave is the wireless protocol used in all Z-wave devices. It allows your thermostat to communicate with your smart home hub and your heating and cooling system. 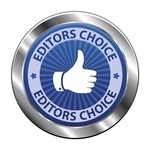 Adding one to your hub often takes a single click, and voila! -- you're in business! Unlike plugin Z-wave devices, a Z-Wave thermostat requires some installation work. This may sound daunting if you haven't installed a thermostat before, but don't worry -- we have an instructional guide that will teach you the fundamentals of thermostats, how they're wired, and what you need to install your Z-Wave thermostat. Known as the Common Wire, it allows a continuous flow of electricity from the red wire (more on that in a bit). Some systems may have the wire but don't use it, while others may not have a C-wire at all. Don't sweat all the wires -- this is a lot less complicated than it looks. In fact, you'll likely only need to concern yourself with the C-wire (the blue wire in the diagram). That's the wire you'll need to hook into your new Z-Wave thermostat. How Do I Wire a Z-Wave Thermostat? 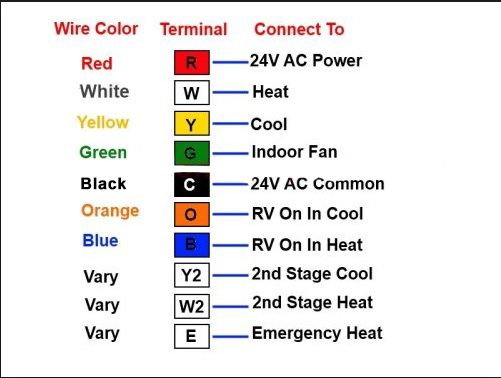 Like in the diagram above, your thermostat will have a terminal strip in it, with letters that represent the color of the wire that goes in each terminal. The location of this terminal may vary, depending on your specific model. Pro Tip: Before you begin wiring your thermostat, turn off the power to your HVAC system. This prevents potential injury or an accident that can lead to expensive repairs. If you would like to learn more about C-Wires, or thermostats in general, check out Smart Thermostat Guide. It's full of great information! Pretty easy, right? Not so much? If tinkering with your furnace feels like you're tempting fate, there is an alternative. With a solid reputation built on accuracy and reliability, this 2gig thermostat has established itself as a great value for the money. The functional design of this 2gig thermostat blends well with virtually any decor and can be managed from your smart hub app. Once you have it paired with your smart hub, it's easy to program in jut a couple of minutes. While the CT100 was designed to work with the Go Control Z-Wave hub, many customers have had success pairing it with the Samsung SmartThings hub and hubs from Vera, too. First off, the thermostat functions great and is very accurate. The thermostat is very basic, but allowing the smarts to be controlled somewhere else (e.g. SmartThings) makes the device very appealing to me. I am just happy to have a thermostat that I can easily program through a zwave hub and interact with my other devices. It's also nice to use presence for setting the temperature. This thermostat can do everything Nest can do, but may require more effort. It is also a lot cheaper than Nest. The CT100 is a simple, easy to program thermostat that works with popular smart hubs. If you're looking for a solid alternative that's less than half of the top-shelf brands, this thermostat is for you. Wire Saver mode to hook it up without a C-wire. Built-in messaging system that tells you the status of your heating and cooling system. Have you ever left home for a few days and rembered after it’s too late to turn around and come back that you left the furnace or air conditioner running? Well, I have, more than once. This device changes all of that. In conguction with a smart hub or amazon echo, etc., you can check and/or set your thermostat from anywhere in the world if you have access to the internet. I use this all the time. Since Alexa can hear me throughout my home I can give a command and alter the thermostat anytime I need. Honeywell has developed a great device and in conjunction with a compatible smart system, you can enjoy having peace of mind you’re not running up a high gas bill while out of the country. While not the cheapest by a long shot, this Honeywell thermostat is still about $100 less than the most expensive models. If you're looking for a thermostat from a well-known brand, this is it. If you're looking for a great value, the 2gig CT100 is a better choice. Smart home owners love this thermostat because it's affordable and compatible with virtually any Z-Wave hub available. It's also one of the easiest to set up straight out of the box. Was easy to install and is simple to operate when you want to make adjustments outside of the automatic control. I also like that I have remote access via my own facilities rather than a manufacturer's central web site. 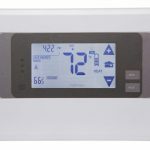 This thermostat also controls more advanced HVAC systems that have multi-stage heating and cooling and emergency heat systems, many thermostats do not. If you have Z-wave home control then this is a better and lower ost solution than the more popular brands. Thumbs up! A popular, inexpensive thermostat that's one of the easiest to set up. With support for multi-stage heating and cooling and a price point well under $100, this thermostat is hard to beat. This thermostat is from another leading brand in heating and cooling, with a large, touch screen control panel. It's about as easy to install as other Z-Wave thermostats and boasts built-in scheduling to efficiently manage your home's temperature during different times of the day. Works with Amazon Alexa and popular Z-Wave hubs. I was skeptical about the fuss of a smart thermostat but decided to give it a try and now I won't go back! I installed this to my heat pump and AC unit wires and it works great. It easily joined my zwave network on my Samsung smartthings hub. I am able to set temp, fan mode, and do scheduling all from the smartthings app. I can also set arrival schedules using my phone as sensor to arrive to a comfortable temp. Even when I'm away and not on my local wifi lan switching temp or fan mode is instantaneous as I'm told by someone at the home. One other thing, this unit does respond well to Alexa through the smartthings skill from the Alexa app. At around $100, this thermostat is a great value. A full array of features combined with easy installation and set up sweeten the deal. Compatibility with most Z-Wave hubs make it a worthy purchase. Before you purchase, however, make sure it's compatible with your heating and cooling system. Remotec has been around for a long time, yet is still a bit of a newcomer to home automation. The ZTS-500 is their latest offering with several improvements over older models. It sports an interface that's unique among Z-Wave thermostats, opting for a 4-way button control over a touch screen. Perhaps the most unusual feature of this thermostat is its AES 128-bit encryption. It's not state-of-the-art encryption, but it's the only thermostat we know of with any encryption. Aside from a few minor quirks, this device is a great option for a Z-wave thermostat. Almost all pre-2018 Z-wave thermostats simply don't have encryption, which was a deal-breaker for me - the encryption on this device worked great out of the box for all command classes. As far as basic "thermostat stuff" - the temperature sensor seems accurate and consistent, the differential and swing options work well to configure the behavior of your HVAC. There's no scheduling capability (your Z-wave gateway will have to do that) - it's pretty much just a simple, dependable thermostat that exposes literally everything to Z-wave. Even at about $120, the ZTS-500 is still over $100 cheaper than a Nest thermostat. Time will tell if there are issues with other smart hubs, but for now, it seems that this thermostat is easy to install and program. If you're into trying something new, this may be the ticket!